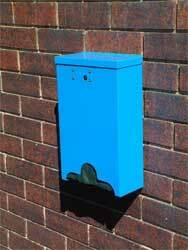 This item is sold as a `Stand alone ‘ bag dispenser which can be attached to any existing post, or wall, or mounted on a supplied post, to facilitate the supply of any singlet style pickup bag. Once collected, the faeces are then placed in a suitable garbage container for subsequent removal by the contractor. Functionally self-evident the DOGGY BIN can be placed at the entrances to parks, beaches or other areas where dogs are taken to be exercised. 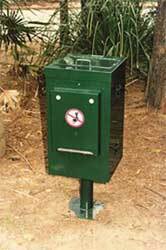 The front or rear mounted bag dispenser permits the dog owner to extract a singlet type collection bag to enable the pick up of faeces and place it in the fly and weather proof flap of this bin. Inside a separate steel liner, which can accept a large bio-hazard bag, collects the refuse in a vermin proof container until such time as it can be collected and cleaned. In the worst case scenario where irresponsible people set fire to the bin, the contents are safely contained within the steel liner. 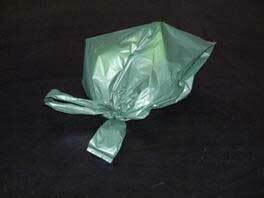 Doggy Pickup Bag manufactured from fully biodegradable corn starch.